I was sitting at home the other evening minding my own business when I started getting these texts from my son Brian who was at a supper club with our own Brooke Bell, Taste of the South editor. Apparently she had put her magic touch on the evening, and the group was completely blown away. Upon later discussion with Brian, it seems that they are in a competition to see who can outdo the other. 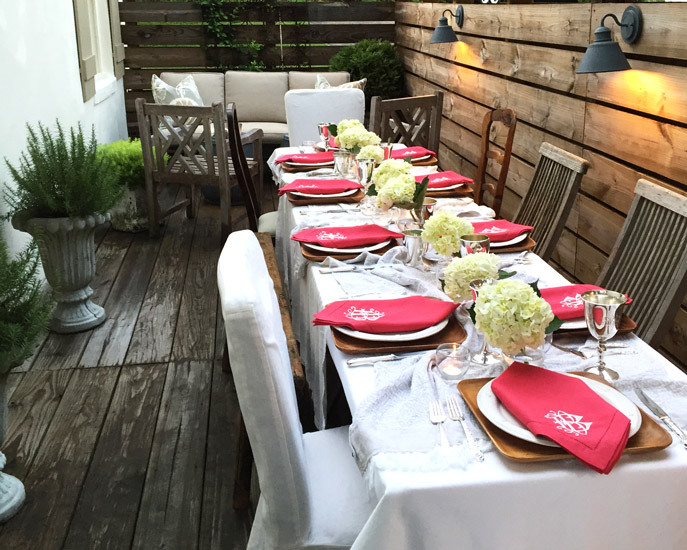 I love the table setting and the wonderful placement of the table outdoors. 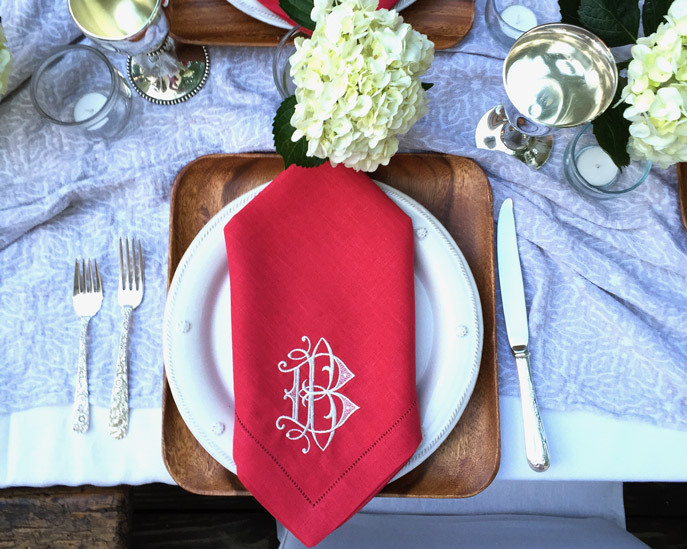 Brooke’s mother has a monogram business, Bobbins Designs, in Fairhope, Alabama, and she designs the most wonderful monogrammed napkins for Brooke’s events. Coupled with beautiful tableware and lovely centerpieces, the setting was perfect. The group selected one cookbook for the year, and each host of their respective dinner had to select menus from the same cookbook and build a theme dinner around it without repeating a recipe. As autumn approaches and the evenings are getting cool enough to entertain outside, plan a casual dinner. Use your creativity in fall entertaining. Pumpkins, gourds, and wonderful Indian corn make great centerpieces for the season. How will you entertain this fall? Being a tablescape junkie, I can’t get enough of your lovely table settings. Thanks for sharing the beauty. Ahh, I can see them toasting and enjoying each others company over a very special meal prepared by the host and hostess. My kinda fun! So lovely! I love the coziness too! Perfect for autumn! Sounds absolutely delightful. Thank you for bringing a touch of fall to us. I am anxiously awaiting for it here in Southern California. we up here in the Midwest, Mn and Wi do a lot around football. Could be corn chowder before the games or maybe grill shrimp or beef after the game..We too set a lovely fall table with all the colors of the season. One can look out the window and see the lovely scapes in all their glory..
What an inviting table. Here in California, entertaining outdoors is easy, especially in fall. When it gets dark earlier, I light up our kitchen patio and serve cocktails and appetizers outside, setting tables with lots of candles. Then we go inside for an easy meal, often soup. I just wrote a few posts about easy Autumn entertaining ideas on my blog. I’m pinning this image to my fall entertaining Pinterest page. I love this idea. What cookbook are they using? I love the draping of the tablecloths, too. It looks like a Renaissance still life!